If you're looking for a destination for a warm holiday during the cold winter season and you want a place that is only a short-haul flight away from Europe, Fuerteventura and the Canary Islands in general are your best bet. As long as you are not expecting a weather similar to that in the Caribbean at the same time of year, you won't be disappointed by your choice to visit. Although Fuerteventura is not classified as a tropical island, the island enjoys a mild climate all year round, with temperatures still around 20°C during the daytime. So even if temperatures will be significantly lower than in summer, compared to the weather the rest of Europe is fighting in winter, the weather in Fuerteventura is sunny, warm and inviting even in January. The temperatures during the day in January are between 20°C and 22°C, which may not seem like a lot, but if the sun is out it will be warm enough to sunbathe comfortably. Other factors like wind speed and cloudiness will influence of course the way that the air temperature feels on the skin. Wind is a constant presence throughout the year in Fuerteventura, so especially during the winter months we recommend that you find small sheltered beaches, instead of long and open beaches, like the ones in the north - Corralejo Grandes Playas. Although the landscape is wonderful and it's great to walk through the dunes and on the beach, when the wind blows there in winter it can feel really chilly, even when the sun is out. If the weather in September is our favourite for spending time on the beach and swimming, the weather in January is ideal for long walks and explorations on foot, as the temperature and weather conditions are ideal for these types of activities. In January we don't feel the need to hide from the sun in the afternoon, like it happens to us in summer and even in September. The UV index is also much lower, and with temperatures still slightly above 20°C during the day, it is just pleasant enough to walk to various corners of the island. If you're looking for a holiday with hot temperatures, then Fuerteventura in January might not be the best idea in your case. If you just need a quick break from the cold back home, with a bit of sun and T-shirt temperatures on most days, then Fuerteventura is a good choice. Just don't expect temperatures of around 30°C or water temperatures similar to the ones in the Indian Ocean, which is something that never happens in the Canary Islands anyway. You just need to be aware of the fact that the weather might not be great every day, rain is also a possibility and periods of clouds are also common during this season. After all, it's winter here as well, although it's definitely better than anywhere else in Europe at this time. The average high temperature in January in Fuerteventura is around 21°C, while at night you can expect temperatures of around 15-16°C. 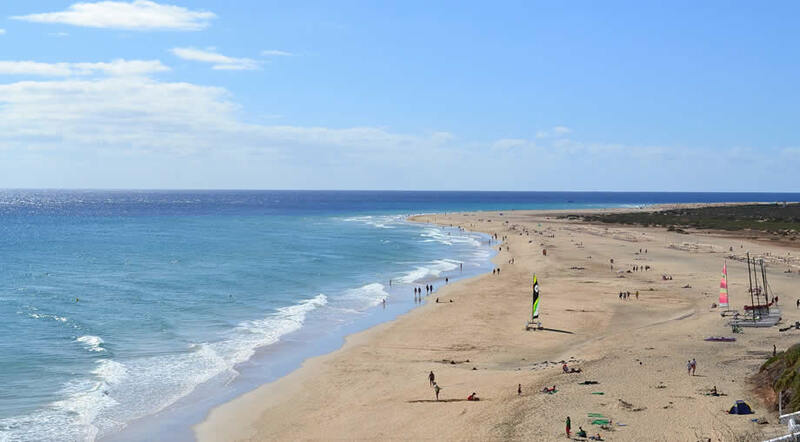 The highest temperature ever recorded in Fuerteventura in January (at Airport station) was of 28.5°C and the lowest was of 8°C. There are no big differences in terms of temperature between resorts in Fuerteventura. January is similar to the month of November in terms of amounts of precipitation and overall rainy days. The average rainfall in January is of 14mm and this occurs during 2 or 3 days throughout the month. Fuerteventura gets an average of 6 hours of sunshine per day in January. As long as the sun is out the weather is usually nice and warm enough for T-shirts or short sleeved blouses. Can you swim in Fuerteventura in January? With an average temperature of 19.4°C / 66.9°F, the ocean is too cold for swimming comfortably in January. Though there may be some who are not bothered by this fact, we usually recommend that you book a villa/apartment or a hotel with a heated pool during the winter months, in order to avoid disappointment in case you can not swim in the sea. Even on days when sunbathing is not an option, you still have plenty of options of things to do in Fuerteventura. There are lots of great places where you can go by yourself, if you simply rent a car and take one of our recommended drives. For a change of scenery, why not visit a museum in Fuerteventura? And why not the Cheese Museum, when cheese is something so important and specific to Fuerteventura? Learn all there is to know about the cheese-making tradition, which has been instrumental to the development of the island right from the beginning. As long as it isn't raining, any day is good for a visit to the Oasis Park. It is an animal park located in the south of Fuerteventura, with a vast collection of animals and lovely grounds where you can spend the entire day. It is great for kids obviously, but adults will enjoy it as well (with or without children). The Three Kings Parade is one of the most anticipated days for people all over Spain. You can take part in this event and also learn more about the Spanish culture, as this is one of the most beloved traditions, which is celebrated in all towns and municipalities.